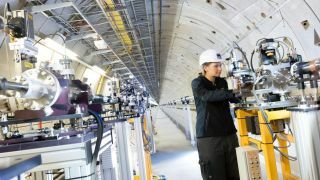 Today, in a tunnel underneath the German city of Hamburg, researchers will inaugurate the European XFEL X-ray Free Electron laser, the largest laser of its kind in the world. The device, which stretches 3.4 kilometres along a tunnel below the city of Hamburg, is designed to generate enormously bright laser flashes at a rate of 27,000 per second. This powerful strobe will let us look deep inside matter. The machine is "like a camera and a microscope that will make it possible to see more tiny details and processes in the nano-world than ever before," Robert Feidenhans'l, chairman of the project's management board, told AFP. The opening comes at the culmination of an eight-year construction process, funded by 11 countries. It'll let teams from around the world take three-dimensional photos of the insides of cells, as well as mapping the structure of viruses. To do that, it'll bounce light along a series of silicon mirrors so smooth that the bumps on its surface measure no more than a millionth of a millimetre in size. The laser slams into metal, sending bundles of electrons flying along a tube cooled to minus 271C, where they're accelerated by microwaves to almost the speed of light. After being gathered into ultrathin discs, the electrons eventually hit a material, giving a series of crisp pictures with a shutter speed of a billionth of a second. Partners in the project, which was headed up by the Deutsches Elektronen-Synchrotron, include Germany, Russia, Denmark, France, Hungary, Italy, Poland, Slovakia, Spain, Sweden and Switzerland.